With one more week as the undisputed champ of the box office, Spider-Man is still the story of the week, even with two relatively high-profile releases on tap. One record-breaking weekend could beget another, as after a phenomenal, record-breaking opening weekend of $114.8 million, it obviously has the inside track on the highest second-weekend total, currently held be the film it dethroned last weekend, Harry Potter and the Sorcerer's Stone. A difference this week is that, unlike last week's slate of seen-it and not-on-your-life fare, the two debuts have a fighting shot at attracting business. The odds-on favorite of the two this week is Unfaithful, which has already opened in New York and Los Angeles, but goes continent-wide on Friday at 2,613 venues. Richard Gere and Diane Lane are the main attractions here, but it also features one Olivier Martinez, the "French Brad Pitt". Or so the trivia screens at the movie theater say, and they wouldn't lie to me, would they? It's from the director of Indecent Proposal, which inexplicably has garnered acclaim over the years, and is tackling the same market but lacks the former's brilliant gimmick. I must remind myself that I, personally, am not this film's target audience, so I'll try and keep my sniggering to a minimum. As I mentioned in my May forecast, I do think this film makes excellent use of its music, a morose little waltz-like number. Richard Gere is also on a bit of a hot streak, if you can call it that, after this January's The Mothman Prophecies opened to a respectable $11.2 million. Diane Lane seems a bit of a non-factor to me, as although she's been in some high-profile films like The Perfect Storm, she's rarely been the main attraction. With dark hints at violence in the trailer, this would look to be covering similar turf as 1998's A Perfect Murder (Martinez does look a little like Viggo Mortensen, after all), but with lower-wattage stars. Evidence of buzz is in its favor, though, as reports of full preview screenings bear witness. I think this film has a better chance of building after it opens, if it delivers to expectations. A good start for such a scenario could be in the area of $13 million. Taking the traditional miscellaneous-May-comedy/romance-about-high-school/young people slot this year is The New Guy. This must be the month for geek wish-fulfillment, though, as hot on the heels of the ultimate nerd fantasy, Spider-Man, comes this quasi-revenge tale about a nerdy high-schooler who goes to prison (the analogy isn't that far off) for toughness lessons. The ads are rather clever, although they do bring out that tired old bit of the whole school rallying around one kid, and then dancing in perfect choreography. Was anyone's high school experience like this? John Hughes would have never resorted to that. DJ Qualls, most famously of Road Trip and recently of Big Trouble, certainly is the right actor for the part; he's got geek cred, as it were. The funniest parts of the commercials come from Eddie Griffin, though, with the sarcastic street smarts that he used to great effect as the highlight of Deuce Bigalow (I can't believe I just typed that sentence). Funny prison jokes and Eliza Dushku aside, I don't think this film has the ability to break past the film from this slot last year, A Knight's Tale, and will have to settle for just over $10 million. As mentioned above, Spider-Man will be taking aim at more box-office records this weekend, chief among them being the fastest to $200 million. Barring disaster, this will be achieved after ten days of release, and possibly nine. Even a 50% drop would better Harry Potter's second-weekend record, although just barely. Unfortunately, given the nature of fan-boyish films, this must be considered a distinct possibility. The previous top ten openers averaged a 44% drop in their second weekends, with only films representing some sort of children's audience able to do significantly better than 50% (Potter, Episode I and Monsters, Inc.). The good news would be that Spider-Man has plenty of kiddie appeal, as any peek into a matinee screening or lineup would tell you. Much of the word-of-mouth is overwhelmingly positive, with a few disappointed with some of the F/X work (personally, I think we've become spoiled on this matter, but that's another rant) and characterization. This represents a minor part of the equation, however, and I don't think it's going to suffer from any large-scale disillusionment. I think these factors lead to a good chance of it holding on to a large portion of its audience, and a drop as small as 40% could be in the offing. This would put it in the high 60s of millions, easily putting a second weekend in the all-time top weekend tallies. 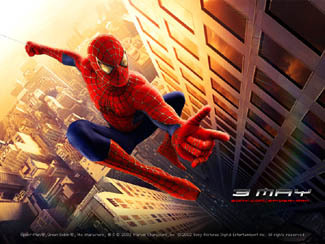 The rest of the films in release try to grab some of that breathing room now that the immense push from Spider-Man has abated to some degree, although few of the films showed any real effect due to the web-slinger. Some films, like The Scorpion King, actually fared a little bit better than in previous weekends, as far as decreases are concerned (It's still on pace to not break the century mark, though). For a film like Jason X, however, a quick fall from any sort of grace had to be expected, and its 65% drop last weekend will go all the way to escorting it out of the top ten in this frame. There's little hope for different behavior from Deuces Wild or Hollywood Ending, last week's other new offerings, although their falls ought not to be quite so sharp. Lingering just below the top ten for several weeks now has been the Mexican film Y Tu Mama Tambien, which has quietly earned near to $10 million. It continues to expand slowly and with a spare May slate, it could sneak close to the top ten, provided it doesn't lose a great swath of screens.